Bison is the powerful and robust creature of the American wilderness. 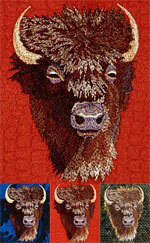 Frames: This Bison Embroidery Portrait is ready to hang on the wall! We can also put a decorative frame on it to mach your decor. See available frames below. This product was added to our catalog on Saturday 05 January, 2008.